Gameboy Development Forum / How to add colors to background tilemap (not using GBTD/GBMB)? » How to add colors to background tilemap (not using GBTD/GBMB)? How to add colors to background tilemap (not using GBTD/GBMB)? After a year and a half of inactivity, I've finally decided to restart GB/GBC development using GBDK and many other tools. With some help from online for some things (also with some trial and error), I've been able to successfully compile several demos, and there's one that I've finished for the classic Game Boy, but I'm having trouble getting it to work with a proper color set. Basically, my GBC demo shows a picture and plays a sample. This picture was converted using a (rather inefficient, since it seems unnecessary to have to use multiple programs to do it) method using GBTK preview to render an image fit for the Game Boy, but since I didn't have an option to optimize tiles in that program, I then saved it as a BMP and converted it to an 8-color PCX using GIMP and in PCX2GB, converted it to a pair of tile-optimized C files which I slightly modified to work with my code (adding variables and such). I then got it to display properly on the Game Boy, and I then added a PCM sample which I (through some trial and error) got to play properly as well. However, I'm currently trying to make a Game Boy Color version of the demo, but I've been having trouble with adding colors to it, even a single palette. 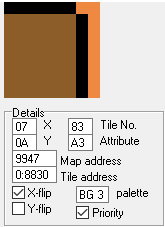 I honestly don't know how I would properly color the entire background, and I would also like to know how to set a palette to each individual background tile. Sprites work just fine; it's the background tiles that I am having problems with. Every example code that uses color background tiles I can find uses GBTD and GBMB, which I will only use for tilesets, and not full-screen images. Can someone please tell me what I should do? Re: How to add colors to background tilemap (not using GBTD/GBMB)? Lemme tell you I know nothing about C for the GB, so I can't give you any code. But, you seem to switch to VRAM bank 1 before writing your background. Actually, you will want to switch to bank 0. At a given address, the byte in bank 0 identifies which tile you want there, and the byte in bank 1 gives its metadata. See there. before you set the tile data.